Benzbromarone (BBR) is a hepatotoxic drug, but the detailed mechanism of its toxicity remains unknown. We identified 2,6-dibromohydroquinone (DBH) and mono-debrominated catechol (2-ethyl-3-(3-bromo-4,5-dihydroxybenzoyl)benzofuran; CAT) as novel metabolites of BBR in rat and human liver microsomal systems by comparison with chemically synthesized authentic compounds, and we also elucidated that DBH is formed by cytochrome P450 2C9 and that CAT is formed mainly by CYP1A1, 2D6, 2E1, and 3A4. Furthermore, CAT, DBH, and the oxidized form of DBH are highly cytotoxic in HepG2 compared with BBR. Taken together, our data demonstrate that DBH, a novel reactive metabolite, may be relevant to BBR-induced hepatotoxicity. Benzbromarone (BBR), a potent human uric acid transporter I inhibitor, is effective in the treatment of hyperuricemia and gout, particularly when allopurinol, an international first-line treatment, is ineffective. BBR has long been in use in Japan (Masseoud et al., 2005) but has been associated with hepatotoxicity, including fulminant or fatal liver injury (van der Klauw et al., 1994). Thus, BBR is not approved for use in the United States and has been withdrawn from the market in Europe (Lee et al., 2008). Adverse reactions are one of the most important issues in drug development and in the therapeutic usage of drugs during the postapproval stage. Specifically, unpredictable, idiosyncratic adverse drug reactions occur only in a small group of patients who are treated with certain drugs at therapeutic doses (Ulrich, 2007). It is widely accepted that drug-induced idiosyncratic hepatotoxicity is often associated with cytochrome P450–mediated bioactivation (Kalgutkar et al., 2012; Stephens et al., 2014). Thus, BBR could be metabolized to reactive metabolites that cause liver injury. Early metabolic studies identified that the major metabolites of BBR are 6-hydroxybenzbromarone (6-OH-BBR) formed by cytochrome P450 isoforms CYP2C9 and CYP2C19, and 1ʹ-hydroxybenzbromarone (1ʹ-OH-BBR) produced by CYP3A4 (McDonald and Rettie, 2007; Kobayashi et al., 2012). It has been reported that human hepatocarcinoma HepG2 cells infected with adenovirus vector expressing CYP2C9 significantly increase the cytotoxicity of BBR, suggesting that CYP2C9 is associated with BBR-induced cytotoxicity (Iwamura et al., 2011). Thus, the formation of 6-OH-BBR catalyzed by CYP2C9 was thought to play a key role in hepatic toxicity. McDonald and Rettie (2007) proposed that 5,6-dihydroxybenzbromarone, the secondary metabolite from 6-OH-BBR by CYP2C9, and the o-quinone form may be reactive metabolites of BBR, although they could not show the formation of such reactive metabolites when BBR was used as a substrate in liver microsomal systems. Conversely, Kobayashi et al. (2013) reported that 6-OH-BBR was not cytotoxic but that BBR and 1ʹ-OH-BBR exhibited cytotoxicity in human hepatocarcinoma FLC4 cells cultured in microspace cells in which the expression levels of CYP2C9 and CYP3A4 had been enhanced. They proposed that 1ʹ-OH-BBR might be the key metabolite that causes liver injury induced by BBR. However, 1ʹ-OH-BBR is formed predominantly by CYP3A4, and it remains unknown why CYP2C9 is primarily responsible for BBR-induced hepatotoxicity. In previous research, we discovered ipso-substitution as a unique metabolic reaction of a variety of substituted phenols by cytochrome P450 (Ohe et al., 1994, 1995, 1997, 2000; Tezuka et al., 2007; Nakamura et al., 2011). 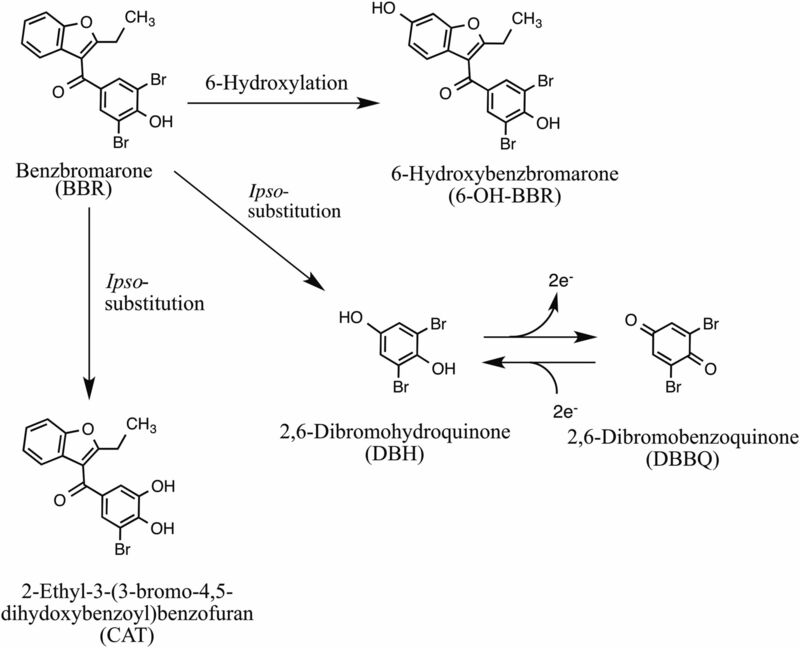 We hypothesized that BBR, which contains a phenolic hydroxyl group, could be oxidized to 2,6-dibromohydroquinone (DBH) and/or mono-debrominated catechol (2-ethyl-3-(3-bromo-4,5-dihydroxybenzoyl)benzofuran; CAT) through ipso-substitution (Fig. 1). The formation of DBH and CAT from BBR might be linked to the mechanism for BBR-induced hepatotoxicity because catechols, hydroquinones, and their oxidized forms are known to be toxic via the formation of covalent bonds with biological macromolecules and the catalytic reduction of oxygen to superoxide and other reactive oxygen species. Proposed metabolic pathway of benzbromarone. Our study elucidates the formation of ipso-substitution metabolites in liver microsomal systems and their cytotoxicity. To this end, we report that these metabolites may be relevant to the hepatotoxicity induced by BBR. NADP+ was obtained from Wako Pure Chemical Industries (Osaka, Japan). Glucose-6-phosphate (G6P) and G6P dehydrogenase (G6PDH) were obtained from Roche Diagnostics (Basel, Switzerland). Hydroquinone and N,O-bis(trimethylsilyl)trifluoroacetamide (BSTFA) were obtained from Tokyo Chemical Industry (Tokyo, Japan). All other reagents used for metabolism and toxicity experiments were of analytic grade. We chemically synthesized ipso-substituted metabolites, CAT, DBH and the oxidized form of DBH (DBBQ), and the known main metabolite 6-OH-BBR as authentic standards for metabolite identification and/or cytotoxicity studies. Briefly, for the synthesis of CAT, vanillin was brominated at the 3-position with Br2 followed by methylation and oxidation to form 3-bromo-4,5-dimethoxybenzoic acid. After treatment with SOCl2, Friedel-Crafts acylation with 2-ethylbenzofuran was directed to the 3-position of the benzofuran ring. Then, the demethylation reaction of the two methoxy groups with BBr3 produced CAT. DBH was obtained via regioselective bromination of 4-methoxyphenol with benzyltrimethylammonium tribromide. DBBQ was directly prepared by the oxidation of DBH using oxone (potassium peroxymonosulfate). 6-OH-BBR was synthesized according to the procedure reported by McDonald and Rettie (2007) with minor modifications. More detailed procedures and analytical data for synthesized compounds are shown in Supplemental Methods. Phenobarbital-treated SD rat and pooled human (200 donors) liver microsomes were purchased from XenoTech (Lenexa, KS). The incubation mixture containing rat or human liver microsomes (1 mg protein/ml), BBR (100 μM), MgCl2 (3 mM), G6P (10 mM), and G6PDH (1 U/ml) with or without tienilic acid (10 μM) in 1.5 ml of 0.1 M K-Pi buffer (pH 7.4) was preincubated for 3 minutes at 37°C. The reaction was initiated by adding NADP+ (1 mM) and incubated for 30 minutes (rat) or 120 minutes (human) at 37°C. We treated 1 ml of the incubation mixture with 2 ml of ice-cold ethyl acetate to stop the reaction and to extract the products, and the organic phase was separated. The organic phase was dried over anhydrous Na2SO4 and concentrated by N2 flushing. The products formed were trimethylsilylated with BSTFA and pyridine. After the removal of the excess BSTFA by N2 flushing, the residue was dissolved in a small amount of acetone and analyzed by gas chromatography with mass spectrometry (GC-MS) (Shimadzu GC-MS-QP5050A, capillary column HP-1 0.32 mm × 30 m; J&W Scientific/Agilent Technologies, Folsom, CA). The injection temperature was 260°C. The initial column temperature was 90°C for 3 minutes; then the temperature was raised at intervals of 10°C/minutes to 250°C, followed by an isothermal hold at this temperature. We treated 0.5 ml of the incubation mixture with 1 ml of acetonitrile/methanol (2:1) to the stop the reaction. All samples were centrifuged at 10,000g for 10 minutes, and the supernatant was analyzed by liquid chromatography with mass spectrometry (LC-MS, 6120; Agilent Technologies, Palo Alto, CA) Chromatographic separations were performed on XBrideShield RP18 column (3.5 μm 2.1 × 150 mm) (Waters Corporation, Milford, MA) at a flow rate 0.2 ml/min under liner isocratic conditions of acetonitrile/water/HCOOH (60/40/0.1). The eluent was introduced directly into the mass spectrometer via electrospray ionization in the negative ion mode. Recombinant human CYP isozymes (EasyCYP Bactosomes) were purchased from Cypex (Dundee, United Kingdom). Incubation was performed under the same conditions used for liver microsomes described earlier, except that the incubation mixture contained 0.1 μM CYP isozymes, 0.1 mM BBR, 4 mM MgCl2, 4 mM G6P, 1 U/ml G6PDH, and 0.4 mM NADP+. Human hepatocarcinoma HepG2 cells were obtained from American Type Culture Collection (Manassas, VA). The HepG2 cells were maintained in minimum essential medium (GIBCO/Life Technologies, Grand Island, NY) containing 5% fetal bovine serum (GIBCO) and 1% penicillin-streptomycin (Sigma-Aldrich, St. Louis, MO) in a 5% CO2 incubator with a humidified atmosphere at 37°C. Cell toxicity was evaluated by a trypan blue dye exclusion test. HepG2 cells were seeded (1 × 106 cells/ml/well) on a 96-well plate (Iwaki/Asahi Techno Glass Corporation, Tokyo, Japan). After 24 hours of incubation, the cells were treated with BBR, 6-OH-BBR, CAT, DBH, and DBBQ at various concentrations. After being incubated with the drugs for 24 hours, the viable cells were counted according to the dye exclusion method using Vi-Cell (Beckman Coulter). Metabolism of BBR by Rat or Human Liver Microsomes. BBR was incubated with phenobarbital-treated rat liver microsomes or pooled human liver microsomes. The metabolite extracts were analyzed by LC-MS for 6-OH-BBR and CAT and analyzed by GC-MS after trimethylsilylation for DBH. All of the metabolites were identified on the basis of retention time and the m/z peak ratio in selected ion monitoring (SIM) mode, compared with the synthesized chemical standards (6-OH-BBR, CAT, and DBH). The quantification results including control incubations [NADP+ (−) and microsomes (−)] are shown in Table 1. The results demonstrate that the novel metabolites CAT and DBH were formed with rat and human hepatic microsomes. Not all of the metabolites were detected when NADP+ or microsomes were omitted from the complete system. Each value represents the mean of three samples ± S.D. Metabolism of BBR by Isozymes of Human CYP. BBR was incubated with various human CYP isozymes expressed in Escherichia coli (bactosomes). The metabolite extracts were analyzed in a similar manner to the metabolic study with liver microsomes, and the amounts of formed metabolites were determined (Table 2). We found that the formation of 6-OH-BBR is catalyzed by CYP1A1, CYP2C8, CYP2C9, CYP2C19, and CYP2D6. CYP1A1, CYP2D6, CYP2E1, and CYP3A4 were found to catalyze the formation of CAT, and DBH was formed by only CYP2C9. Effect of CYP2C9 Inhibitor on the BBR Metabolite Formation. Additionally, we investigated the effect of tienilic acid, a mechanism-based inhibitor specific for CYP2C9, on the formation of three metabolites from BBR in human liver microsomes to confirm the contribution of CYP2C9. BBR was incubated with human liver microsomes in the presence of 10 μM tienilic acid, and the amounts of formed metabolites were determined. As shown in Supplemental Figure 1, the formation of 6-OH-BBR was markedly inhibited by tienilic acid, and the formation of DBH was also significantly inhibited. In contrast, tienilic acid had no inhibitory effect on the formation of CAT from BBR. Cytotoxicity of BBR and BBR Metabolites in HepG2 Cells. The cell toxicities of BBR, 6-OH-BBR, CAT, and DBH in the hepatocyte cell line (HepG2 cells) were assessed by the use of the trypan blue dye exclusion method after 24 hours of drug exposure. In addition, based on the possible significance of DBH for the bioactivation process of BBR, the toxicity of DBBQ, the oxidized form of DBH, was also evaluated because DBH is thought to be easily oxidized to DBBQ during incubation, although DBBQ can never be detected in the extracts from the microsomal system because of its susceptibility to bind to macromolecules. The cell toxicities of the compounds at various concentrations are demonstrated in Supplemental Figure 2. As shown in Fig. 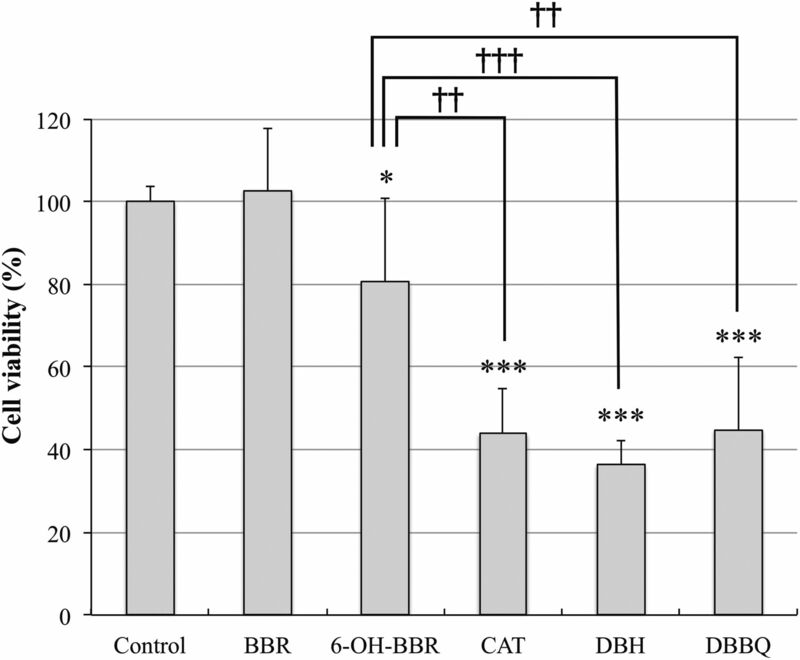 2, the ipso-substituted metabolites CAT, DBH, and DBBQ induced significant cytotoxicity at the lowest concentration (0.4 μM), and they exhibited more potent toxicity than did 6-OH-BBR. On the other hand, BBR was not cytotoxic at this concentration. Cytotoxicity of BBR and BBR metabolites at 0.4 μM in HepG2 cells. Cell viability was assessed by the use of the trypan blue dye exclusion method after 24 hours of drug exposure. The data are expressed relative to control incubations containing 0.1% DMSO alone. Each value represents the mean ± S.D. of six determinations from two separate experiments. ***P < 0.001 and *P < 0.05 compared with the control incubations. †††P < 0.001 and ††P < 0.01 versus the incubations with 6-OH-BBR. The exact mechanisms leading to the hepatocellular toxicity of BBR, a therapeutically useful uricosuric drug, are not yet understood. The present study is an attempt to elucidate the cause of BBR-induced liver toxicity by proposing a novel bioactivation mechanism for BBR. First, we hypothesized that BBR, which contains a phenolic hydroxyl group, could be subject to an ipso-substitution metabolism, which we had previously discovered as a unique metabolic pathway catalyzed by CYP and oxidized to DBH and/or CAT. As shown in Table 1, DBH and CAT were formed in rat and human microsomal systems in NADPH- and microsome-dependent manners, as determined from comparison with the synthetic standards, although the formation amounts were much lower than that of 6-OH-BBR. The production of CAT and DBH may be underestimated because the recovery of these metabolites from the microsomal incubation mixtures was shown to be low (data not shown) probably due to the covalent binding of the oxidized forms (quinone forms) with macromolecules such as proteins. Isozyme profiling with recombinant CYP bactosomes clarified that the formation of 6-OH-BBR is catalyzed by CYP1A1, CYP2C8, CYP2C9, CYP2C19, and CYP2D6. This result is consistent with the previous reports that CYP2C9 and CYP2C19 are the major isozymes capable of catalyzing the formation of 6-OH-BBR (McDonald and Rettie, 2007; Kobayashi et al., 2012). CYP2C9 was also responsible for the formation of DBH from BBR. The additional analysis using the CYP2C9 specific inhibitor further confirmed that CYP2C9 contributes to 6-hydroxylation of BBR and ipso-substitution metabolism to generate DBH. There have been some reports that CYP2C9 is primarily responsible for BBR-induced liver toxicity. Iwamura et al. (2011) reported that HepG2 cells infected with adenovirus vector expressing CYP2C9 significantly increase the cytotoxicity of BBR. McDonald and Rettie (2007) suggested that the catechol metabolite 5,6-dihydroxybenzbromarone, which is formed via 6-OH-BBR, and its o-quinone form may be reactive metabolites and that the sequential metabolism is catalyzed by CYP2C9, although they did not show the formation of such reactive metabolites directly from BBR in liver microsomal systems, and their cytotoxicity has not been elucidated. We have demonstrated that 6-OH-BBR was cytotoxic to HepG2 cells but the toxicity was not remarkable. Conversely, novel metabolites, DBH, and CAT showed more potent cytotoxicity than BBR and 6-OH-BBR, suggesting that the ipso-substituted metabolites may possibly be reactive metabolites. In addition, the cytotoxicity of the quinone form of DBH, DBBQ, was also examined because it is thought that DBH is easily oxidized to DBBQ in liver microsomal systems. DBBQ also exhibited potent cytotoxicity that is comparable to that of DBH and CAT. Taking into consideration that DBH is mainly formed by CYP2C9, the contribution of DBH and DBBQ to BBR-induced hepatotoxicity, in particular, might be important. As described earlier, Kobayashi et al. (2013) proposed that the metabolic activation via 1ʹ-OH-BBR formed by CYP3A4 might be responsible for BBR-induced hepatotoxicity, but the mechanism is not yet clear; it remains unknown why CYP2C9 enhances the cytotoxicity of BBR. Our study clearly presents an alternative mechanism for BBR-induced hepatotoxicity activated by CYP2C9. In conclusion, we have demonstrated the formation of reactive metabolites in liver microsomal systems via an ipso-substitution metabolism of BBR, which is a novel metabolic pathway for BBR. We consider that the formation of DBH or DBBQ might be one of the reasons for hepatocellular toxicity induced by BBR. Additional studies to investigate the detailed mechanism for BBR-induced hepatotoxicity are in progress. Participated in research design: Ohe, Kitagawara, Takahashi, Nakamura, Mashino. Contributed new reagents or analytic tools: Kitagawara, Ohe, Tachibana. Performed data analysis: Kitagawara, Ohe. Wrote or contributed to the writing of the manuscript: Ohe, Kitagawara, Mashino. This work was supported by Keio Gijuku Academic Development Funds; a grant from the Science Research Promotion Fund of the Japan Private School Promotion Foundation; and Platform for Drug Discovery, Informatics; and Structural Life Science from the Ministry of Education, Culture, Sports, Science and Technology of Japan (MEXT). (2011) CYP2C9-mediated metabolic activation of losartan detected by a highly sensitive cell-based screening assay. Drug Metab Dispos 39:838–846. (2012) Methods and Principles in Medicinal Chemistry: Reactive Drug Metabolites, Wiley-VCH, Weinheim, Germany. (2012) Identification of CYP isozymes involved in benzbromarone metabolism in human liver microsomes. Biopharm Drug Dispos 33:466–473. (2013) Cytotoxic effects of benzbromarone and its 1′-hydroxy metabolite in human hepatocarcinoma FLC4 cells cultured on micro-space cell culture plates. Drug Metab Pharmacokinet 28:265–268. (2008) A benefit-risk assessment of benzbromarone in the treatment of gout. Was its withdrawal from the market in the best interest of patients? Drug Saf 31:643–665. (2005) Overview of hyperuricaemia and gout. Curr Pharm Des 11:4117–4124. (2007) Sequential metabolism and bioactivation of the hepatotoxin benzbromarone: formation of glutathione adducts from a catechol intermediate. Chem Res Toxicol 20:1833–1842. (2011) Ipso substitution of bisphenol A catalyzed by microsomal cytochrome P450 and enhancement of estrogenic activity. Toxicol Lett 203:92–95. (1994) Novel metabolic pathway of arylethers by cytochrome P450: cleavage of the oxygen-aromatic ring bond accompanying ipso-substitution by the oxygen atom of the active species in cytochrome P450 models and cytochrome P450. Arch Biochem Biophys 310:402–409. (1995) Novel oxidative pathway of para-substituted phenols in cytochrome P450 chemical model: substituent elimination accompanying ipso-substitution by the oxygen atom of the active species. Tetrahedron Lett 42:7681–7684. (1997) Substituent elimination from p-substituted phenols by cytochrome P450. ipso-Substitution by the oxygen atom of the active species. Drug Metab Dispos 25:116–122. (2000) Novel metabolic pathway of estrone and 17β-estradiol catalyzed by cytochrome P-450. Drug Metab Dispos 28:110–112. (2014) Mechanisms of drug-induced liver injury. Curr Opin Allergy Clin Immunol 14:286–292. (2007) Novel metabolic pathways of p-n-nonylphenol catalyzed by cytochrome P450 and estrogen receptor binding activity of new metabolites. J Health Sci 53:552–561. (2007) Idiosyncratic toxicity: a convergence of risk factors. Annu Rev Med 58:17–34. (1994) Hepatic injury caused by benzbromarone. J Hepatol 20:376–379.